The thought of fresh, homemade pasta has always sounded like a wonderful idea but really filled me with trepidation. To start, finding consensus on a pasta dough recipe is impossible. Some have olive oil, some, salt and yet others have both or neither. Even their egg usage varies. There are countless different kneading, resting and drying methods and the choice between making it by hand or machine. It all makes the dried pasta aisle very attractive. But when all of this has got you feeling very overwhelmed, remember that Nonnas in Italian hilltop towns have been making their pasta by hand with very few ingredients and little effort for centuries. With this in mind, I got stuck in. With the help of some reliable products, like the Yuppiechef Pasta Machine and a food processor, I could make pasta more easily than I had imagined and, once I got the hang of it, very quickly too. 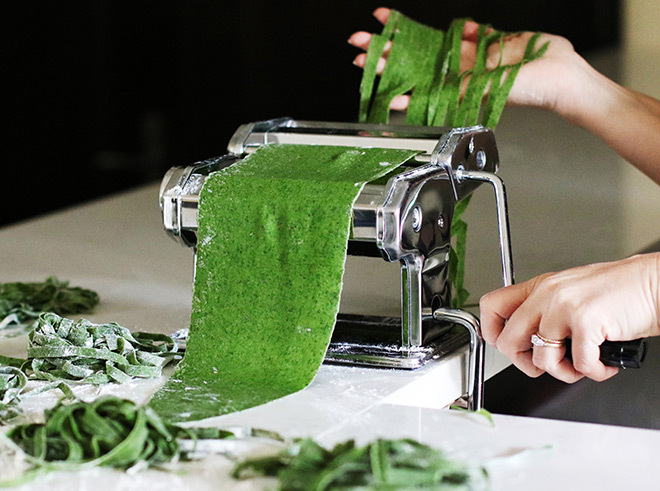 Whether you make it by hand or with a food processor, pasta dough is very forgiving. It is, by nature, soft and chewy; the perfect base for a delicious sauce. This recipe is incredibly simple and you will find using the Yuppiechef Pasta Machine so enjoyable; something you can easily do together with your kids. This is a little twist on a traditional pasta recipe. 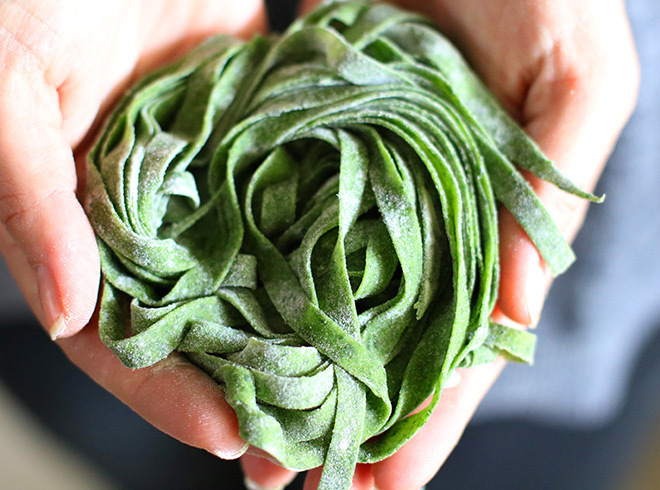 The spinach and herbs give the pasta a vibrant colour and lovely fresh, fragrant smell. I added a bit of salt to the dough but feel free to omit it and just remember to add extra salt to the water. Most importantly, remember to enjoy the process of creating something so simple and beautiful. 1. Place a pot of water onto the stove to boil. 2. Once the water is boiling, put your spinach, into a colander and into the pot and allow to steam until soft and wilted (approximately 2 minutes). 3. Once cooked, remove from the heat and squeeze to remove excess moisture. 4. Place in a food processor and puree until smooth. 5. Add fresh parsley and basil and pulse until fine. 6. Add the eggs and yolk and process until combined. 7. Add the flour and salt, and process until dough just comes together. 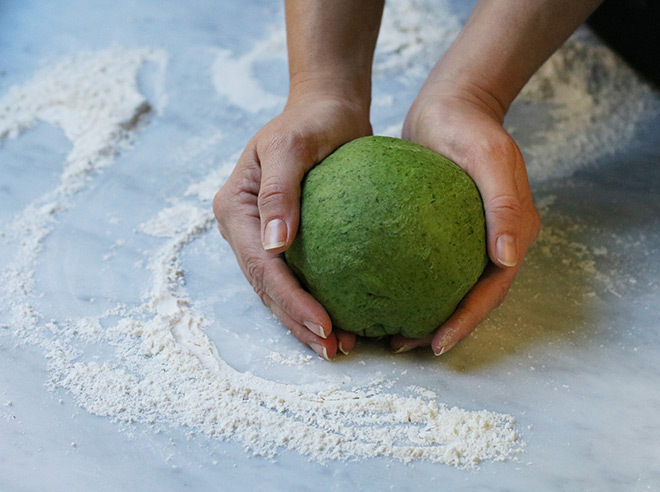 Alternatively, place the flour onto a clean surface, make a well in the centre and add the spinach and egg mixture to this, slowly combining from the outer edge to the centre to make a dough ball. 8. Transfer the dough to a well-floured surface. 9. Knead the dough until smooth and elastic (approximately 10 minutes). This can also be done with the dough hook of your food processor. 10. At this point, you may need to knead in a tablespoon or two of flour if the dough remains too sticky. 11. Wrap the dough tightly in cling film and leave to rest for 1 to 2 hours. 12. Divide the dough into six. 13. Work with one piece at a time keeping the remaining pieces covered. 14. Flatten the dough into an oblong shape slightly thinner than the pasta machine’s widest setting (number 1). 15. Dust the dough very lightly with flour, and feed it through the machine, turning the handle as you go. 16. Repeat twice on the same setting. This will smooth the dough and increase its elasticity. 17. Turn the dial to the next narrower setting. 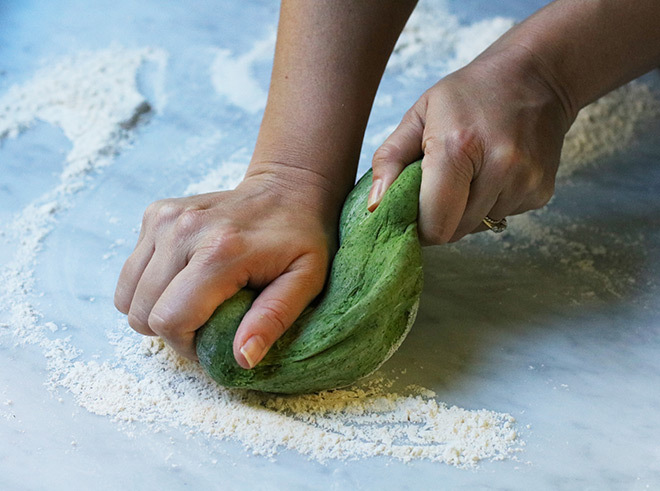 Pass dough through twice, gently supporting it with your hand. 18. Continue passing the dough through ever-finer settings, twice on each setting, until the sheet is almost translucent and very thin but still intact. 19. If the dough bubbles or tears, pass it through the machine again. If the dough is sticking, dust it with a little flour before passing it through the machine. Place the rolled sheet on a lightly floured surface, and cut out as required. Use a dry brush to dust off excess flour.For ribbon pasta: Place the dough on a drying rack for 10 to 15 minutes. It will become slightly tacky. Use the cutting attachment on the pasta machine to cut into strands. Drape over a drying rack until the strands have dried slightly and won’t stick together (approximately 20 minutes). Cook immediately, or lay flat on a baking sheet dusted with flour, cover tightly with plastic wrap and refrigerate overnight. Place the dough sheets on a pasta drying rack for 10 to 15 minutes. This step is important. The dough needs to dry out a bit and become slightly firmer. 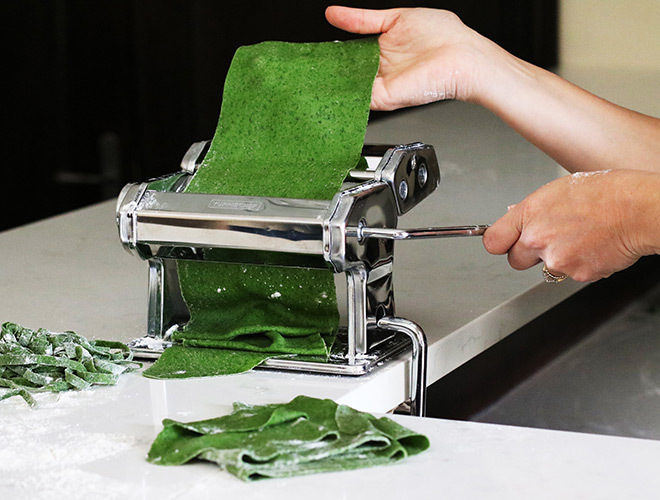 Use the cutting attachment on the pasta machine to cut into strands the same way you made the sheets. 22. Drape over a drying rack until the strands have dried slightly and won’t stick together (approximately 20 minutes). 23. Cook immediately, or lay flat on a baking sheet dusted with flour, cover tightly with plastic wrap and refrigerate overnight. Always lightly flour the pasta dough before passing it through the machine so it does not stick to the inner components. Lightly flour the drying rack so the pasta does not stick. There’s nothing worse than your freshly made strands clamping around their temporary home and having to be pried and pulled apart. Make sure the rectangle of dough is fed straight into the machine otherwise you will end up with folds and an uneven thickness. Ensure your machine is tightly attached to the counter so it does not slip when rolling the dough through. Never use water to wash your pasta machine (this could cause it to rust), just dust any remaining flour or dough off with a pastry brush. Always keep dough that you are not working with properly covered so it does not dry out. For storage, make sure your pasta ribbons are nicely dusted with flour so they do not stick together. Store in the fridge immediately and use as soon as possible for the freshest tasting pasta. 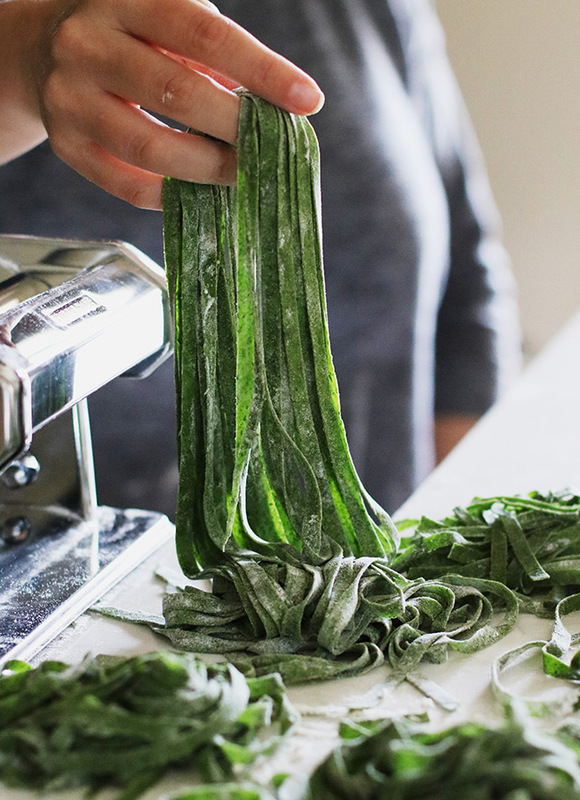 Do yourself a favour and invite homemade pasta nights into your family’s regular routine. It’s one activity that is sure to pry everyone away from their devices and get stuck in in the kitchen cooking dinner together.